Mr. Nashville: LIFEHOUSE: GREATEST HITS AVAILABLE TODAY! Billboard.com Features Exclusive Video on "You and Me"
Album Features 18 tracks, Including Chart-Topping "Hanging by a Moment" and "You and Me"
LOS ANGELES, Calif. – Multi-platinum award-winning rock band Lifehouse released their first hits compilation, Lifehouse: Greatest Hits, on CD and all digital retailers today (July 14). The 18-track selection includes a multitude of their chart-topping hits, including “You and Me,” “First Time”, “Halfway Gone,” “Hurricane” and "Hanging by a Moment," which was the most played radio track of 2001. CLICK HERE TO ORDER. In an exclusive video track premiere on Billboard.com, Jason Wade (lead vocals, guitar) opens up about how he proposed to his wife with their chart-topping hit "You and Me." "I've always believed that a song has to mean something to you first if it's going to mean anything to anybody else. That's the case with 'You and Me,'" Wade tells Billboard. "I knew right away when it was finished being written that I was going to propose to my girlfriend with it -- on a cassette tape, funny enough." To mark the release, Wade, along with Bryce Soderberg (bass, vocals) and Ricky Woolstenhulme Jr. (drums, percussion), will co-headline a U.S. tour with Switchfoot, starting July 23 at the Fillmore Auditorium in Denver, CO, and wrapping September 10 at the Masonic Auditorium in San Francisco after a show on September 9 at the Greek Theater in Los Angeles. CLICK HERE TO PURCHASE TICKETS. Lifehouse was formed in Los Angeles by singer/songwriter/guitarist Jason Wade, bassist Bryce Soderberg and drummer Rick Woolstenhulme Jr. as Blyss in 1999, attracting the attention of producer Jude Cole and eventually, veteran A&R executive Michael Ostin, who signed the band to DreamWorks for their 2000 debut, No Name Face, which produced “Hanging by a Moment,” a #1 Modern Rock hit which crossed over to become Top 40’s Most Played Song, peaking at #2 on the Hot 100. “Hanging by a Moment,” (#2 Hot 100, #2 Pop Songs), “Sick Cycle Carousel,” “Breathing” and “Everything” all come from the band’s debut album No Name Face, which peaked at #6 on the Billboard 200, and has since gone on to sell more than four million copies worldwide, almost three million in the U.S.
“Spin” and “Take Me Away” are taken from the band’s second album, 2002’s Stanley Climbfall, while the eponymous 2005 album produced the dual chart-topping Top 5 smash ballad “You and Me” (#1 at both Adult Top 40 and Adult Contemporary, #5 Hot 100, #4 Top 40, #4 Pop Songs) and “Blind.” The album itself debuted at #10 on the Billboard 200 and was eventually certified platinum. Who We Are, released in 2007, contributes the multi-format hits “First Time” (#3 Adult Top 40, #17 Adult Contemporary, #16 Mainstream Top 40), “Whatever It Takes” (#3 Adult Top 40, #10 Adult Contemporary), and the radio version of “Broken” (#7 Adult Top 40). Their collaboration with Kevin Rudolf, “Halfway Gone” (#2 Adult Top 40, #12 Adult Contemporary,) “Falling In,” “All In” (#6 Adult Top 40), “From Where You Are” and “It Is What It Is” are all from the band’s fifth studio album, Smoke & Mirrors, originally released in 2010. “Between the Raindrops,” their collaboration with British singer Natasha Bedingfield, was the lead single from their sixth studio album, 2012’s Almeria, scoring on three separate Billboard charts (#21 Adult Pop Songs, #27 Adult Alternative Songs, #79 Hot 100). The compilation’s final track, “Hurricane,” is from the band’s 2015 indie Ironworks Music release, Out of the Wasteland, which went to #30 on the Hot Adult chart and #31 at Adult Pop Songs. Lifehouse’s music has always been radio-friendly, but the band’s success is as much for lead singer/guitarist Jason Wade’s “sonorous” vocals and spiritual songwriting as it is for the band’s well-honed cohesion as performers. As he once explained about his creative process: “I’m comfortable being myself. The songs I’ve written that have connected to the most people have occurred when I’m not worrying about how everyone will react. I’m writing from an honest place, alone in my room not thinking about who’s going to hear it, what they’re going to think or how they’re going to interpret it. The lyrics can’t be contrived. 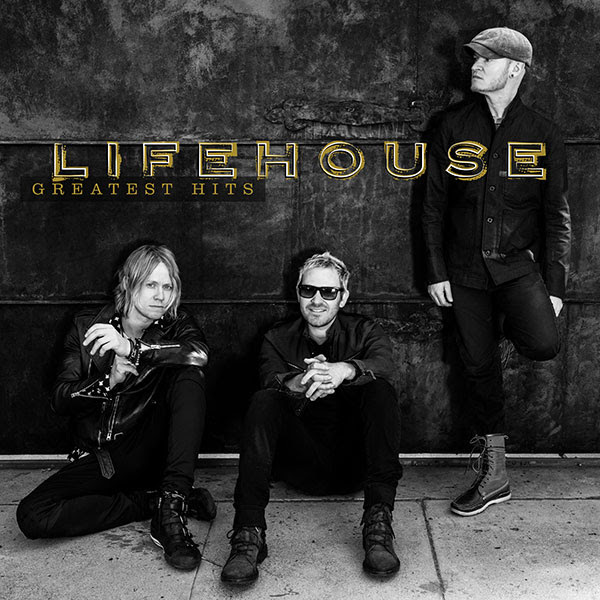 They have to hit you right in the heart.” Lifehouse: Greatest Hits does just that. 7/26: Columbus, Ohio / Express Live!